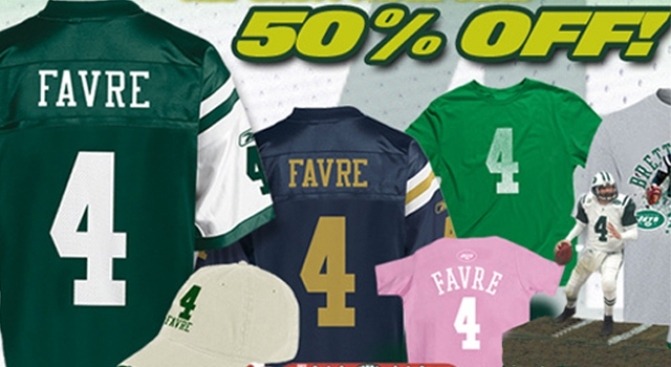 News of Brett Favre's retirement was only hours old when the Jets website began promoting a sale on all his merchandise. Unlike the football season's final Sunday morning, when Modell's hilariously advertised Brett Favre merchandise for 50 percent off before the Jets lost to effectively end his career, this week, the team's Web site isn't just trying to unload now-worthless gear. No, they're encouraging fans to "celebrate the historic career of #4." Why Should Vulture Investors Help Out America When America Is So Mean to Them?